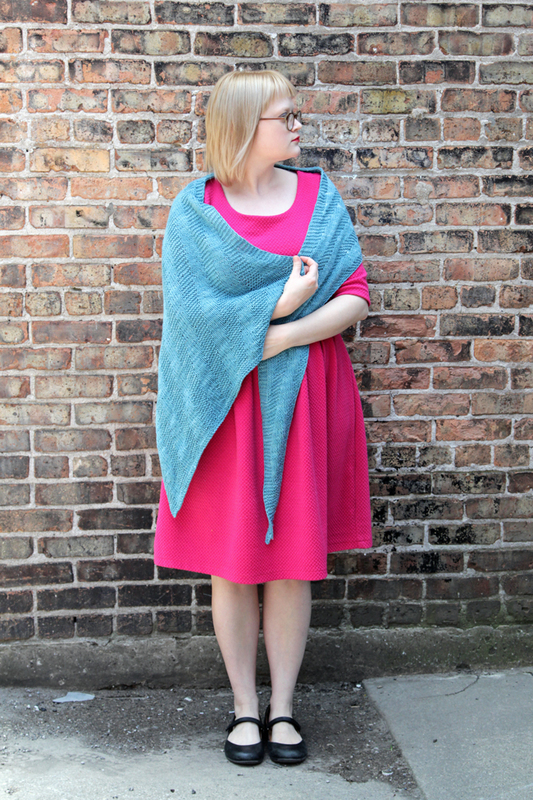 In case this isn’t incredibly obvious by now, I love knitting shawls. 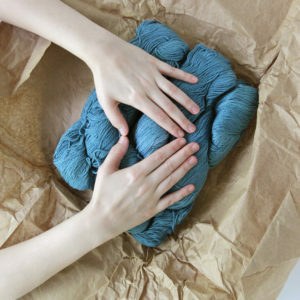 I’m obsessed with playing with the geometry possibilities, the outfit possibilities, and the chance to show off some beautiful yarn on the canvas that is a big, flat piece of knitting. 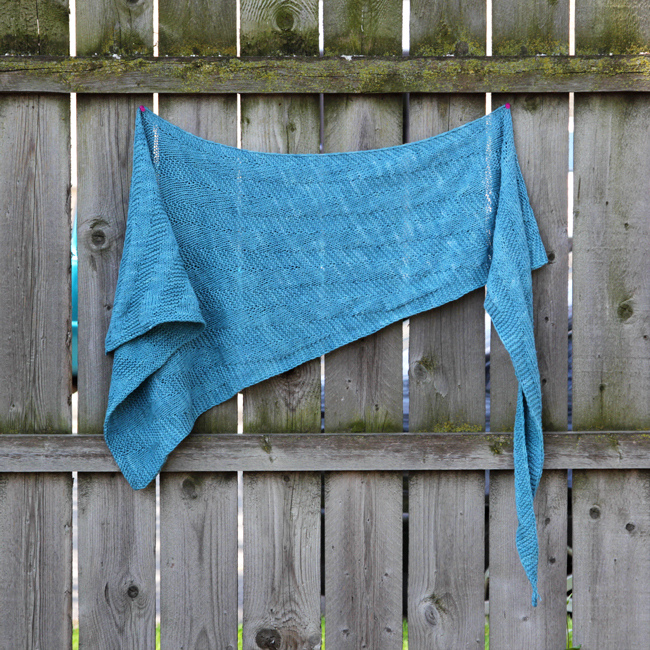 This new shawl pattern began as a wee experiment with making a shawl featuring increases along one side of the work every few rows, which forms a right triangle. 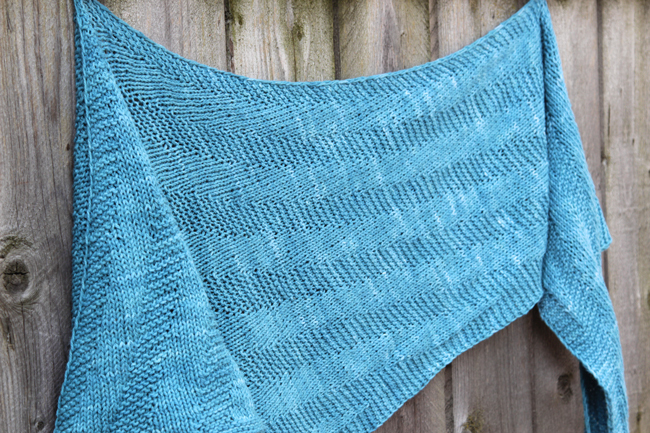 I love the fact that the yarn over increases are hidden in this piece’s chain edge, and I love that its wide, diagonal ribs are formed by simply alternating groups of 6 knit and purl stitches, hence the name Sixth Degree Shawl. I hope you enjoy knitting this as much as I did! 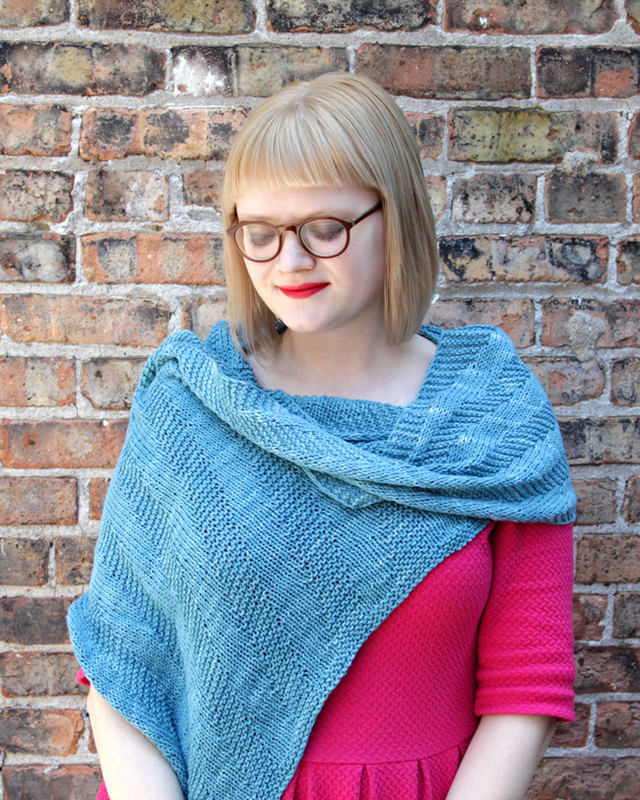 The shallow slope of the Sixth Degree Shawl’s increases make for a super wearable shawl. The short leg is long enough to reach past the hips, covering the torso when worn as a wrap. The pointy end, so to speak, hangs in place nicely when you wear it. I can’t wait to cuddle up with this shawl all summer in hyper air conditioned spaces and stash it in my bag when venturing out into hot temps! 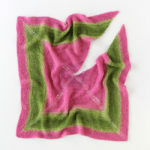 As you work on this shawl, place and slip markers as you prefer to keep track of k and p sections. 1-3. sl 1 wyif, k1, k1 tbl. 4. (RS) sl 1 wyif, yo, k to last st, k1 tbl. 5-7. sl 1 wyif, k to last st, k1 tbl. Repeat rows 4-7 until there are 12 sts. 8. (RS) sl 1 wyif, yo, k to last st, k1 tbl (13 sts). 9. (WS) sl 1 wyif, k5, p1, k to last st, k1 tbl. 10. (RS) sl 1 wyif, k to last st, k1 tbl. 12. (RS) sl 1 wyif, yo, k to last st, k1 tbl (14 sts). 13. (WS) sl 1 wyif, k5, p2, k to last st, k1 tbl. 14. (RS) sl 1 wyif, k to last st, k1 tbl. 16. (RS) sl 1 wyif, yo, k to last st, k1 tbl (15 sts). 17. (WS) sl 1 wyif, k5, p3, k to last st, k1 tbl. 18. (RS) sl 1 wyif, k to last st, k1 tbl. 20. (RS) sl 1 wyif, yo, k to last st, k1 tbl (16 sts). 21. (WS) sl 1 wyif, k5, p4, k to last st, k1 tbl. 22. (RS) sl 1 wyif, k to last st, k1 tbl. 24. (RS) sl 1 wyif, yo, k to last st, k1 tbl (17 sts). 25. (WS) sl 1 wyif, k5, p5, k to last st, k1 tbl. 26. (RS) sl 1 wyif, k to last st, k1 tbl. 28. (RS) sl 1 wyif, yo, k to last st, k1 tbl (18 sts). 29. (WS) sl 1 wyif, k5, p6, k to last st, k1 tbl. 30. (RS) sl 1 wyif, k to last st, k1 tbl. 32. (RS) sl 1 wyif, yo, k to last st, k1 tbl (19 sts). 33. (WS) sl 1 wyif, k5, k1, p6, k to last st, k1 tbl. 34. (RS) sl 1 wyif, k to last st, k1 tbl. 36. (RS) sl 1 wyif, yo, k to last st, k1 tbl (20 sts). 37. (WS) sl 1 wyif, k5, k2, p6, k to last st, k1 tbl. 38. (RS) sl 1 wyif, k to last st, k1 tbl. 40. (RS) sl 1 wyif, yo, k to last st, k1 tbl (21 sts). 41. (WS) sl 1 wyif, k5, k3, p6, k to last st, k1 tbl. 42. (RS) sl 1 wyif, k to last st, k1 tbl. 44. (RS) sl 1 wyif, yo, k to last st, k1 tbl (22 sts). 45. (WS) sl 1 wyif, k5, k4, p6, k to last st, k1 tbl. 46. (RS) sl 1 wyif, k to last st, k1 tbl. 48. (RS) sl 1 wyif, yo, k to last st, k1 tbl (23 sts). 49. (WS) sl 1 wyif, k5, k5, p6, k to last st, k1 tbl. 50. (RS) sl 1 wyif, k to last st, k1 tbl. 52. (RS) sl 1 wyif, yo, k to last st, k1 tbl (24 sts). 53. (WS) sl 1 wyif, k5, k6, p6, k to last st, k1 tbl. 54. (RS) sl 1 wyif, k to last st, k1 tbl. 56. (RS) sl 1 wyif, yo, k to last st, k1 tbl (25 sts for first stockinette stripe). 57. (WS) sl 1 wyif, k5, p1, (k6, p6) to last 6 sts, k5, k1 tbl. 58. (RS) sl 1 wyif, k to last st, k1 tbl. 60. (RS) sl 1 wyif, yo, k to last st, k1 tbl (26 sts for first stockinette stripe). 61. (WS) sl 1 wyif, k5, p2, (k6, p6) to last 6 sts, k5, k1 tbl. 62. (RS) sl 1 wyif, k to last st, k1 tbl. 64. (RS) sl 1 wyif, yo, k to last st, k1 tbl (27 sts for first stockinette stripe). 65. (WS) sl 1 wyif, k5, p3, (k6, p6) to last 6 sts, k5, k1 tbl. 66. (RS) sl 1 wyif, k to last st, k1 tbl. 68. (RS) sl 1 wyif, yo, k to last st, k1 tbl (28 sts for first stockinette stripe). 69. (WS) sl 1 wyif, k5, p4, (k6, p6) to last 6 sts, k5, k1 tbl. 70. (RS) sl 1 wyif, k to last st, k1 tbl. 72. (RS) sl 1 wyif, yo, k to last st, k1 tbl (29 sts for first stockinette stripe). 73. (WS) sl 1 wyif, k5, p5, (k6, p6) to last 6 sts, k5, k1 tbl. 74. (RS) sl 1 wyif, k to last st, k1 tbl. 76. (RS) sl 1 wyif, yo, k to last st, k1 tbl (30 sts for first stockinette stripe). 77. (WS) sl 1 wyif, k5, p6, (k6, p6) to last 6 sts, k5, k1 tbl. 78. (RS) sl 1 wyif, k to last st, k1 tbl. 80. (RS) sl 1 wyif, yo, k to last st, k1 tbl (31 sts for first garter stripe). 81. (WS) sl 1 wyif, k5, k1, (p6, k6) to last 12 sts, p6, k5, k1 tbl. 82. (RS) sl 1 wyif, k to last st, k1 tbl. 84. (RS) sl 1 wyif, yo, k to last st, k1 tbl (32 sts for first garter stripe). 85. (WS) sl 1 wyif, k5, k2, (p6, k6) to last 12 sts, p6, k5, k1 tbl. 86. (RS) sl 1 wyif, k to last st, k1 tbl. 88. (RS) sl 1 wyif, yo, k to last st, k1 tbl (33 sts for first garter stripe). 89. (WS) sl 1 wyif, k5, k3, (p6, k6) to last 12 sts, p6, k5, k1 tbl. 90. (RS) sl 1 wyif, k to last st, k1 tbl. 92. (RS) sl 1 wyif, yo, k to last st, k1 tbl (34 sts for first garter stripe). 93. (WS) sl 1 wyif, k5, k4, (p6, k6) to last 12 sts, p6, k5, k1 tbl. 94. (RS) sl 1 wyif, k to last st, k1 tbl. 96. (RS) sl 1 wyif, yo, k to last st, k1 tbl (35 sts for first garter stripe). 97. (WS) sl 1 wyif, k5, k5, (p6, k6) to last 12 sts, p6, k5, k1 tbl. 98. (RS) sl 1 wyif, k to last st, k1 tbl. 100. (RS) sl 1 wyif, yo, k to last st, k1 tbl (36 sts for first garter stripe). 101. (WS) sl 1 wyif, k5, k6, (p6, k6) to last 12 sts, p6, k5, k1 tbl. 102. (RS) sl 1 wyif, k to last st, k1 tbl. Repeat adding subsequent stockinette and subsequent garter stripe sections (rows 56-103) until there are 8 stockinette stripes or until you are nearly through your second skein of yarn. End by knitting across 6 rows (both right and wrong sides), binding off (BO) last WS row. Weave in all ends and block to finish. The yarn used for this pattern was provided by Yarnthology. 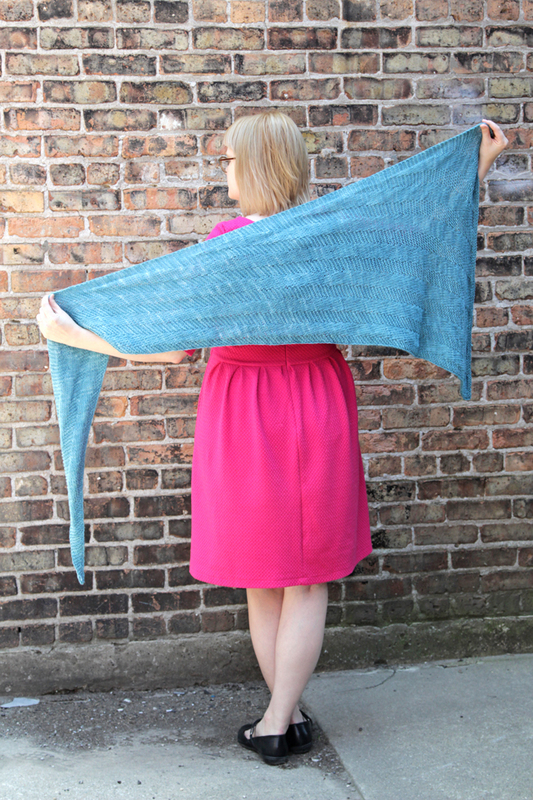 Tune in Wednesday, May 11 for a review & giveaway of their service and the yarn used to make this shawl! 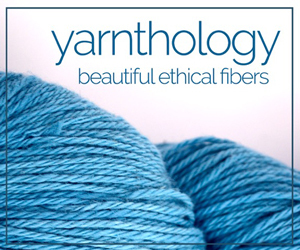 Meet Yarnthology & Win Some Yarn! Thank you for the pattern…it’s lovely. Thank you so much for this wonderful pattern, Heidi. Lovely shawl. Thank you for sharing it with us. 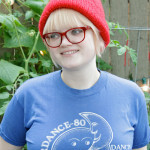 At the Black Mountain Yarn Shop and loving your free pattern! Thank you for this lovely patter! Could you please explain to me what tbl means? When you tbl in the last stich, does it mean that you knit twice the same stich( into the front loop first and back loop afterwords), or does it mean that you knit the stich just once into the back loop? Thanks very much for this lovely pattern. Does it lie flat or curl up? There’s a subtle curl to the pointy end, but it lies pretty flat overall. Completely obsessed by this pattern at the moment it goes everywhere with me….love it! Very pretty. This pattern works well for my senior care residents. I love this pattern. Could you please,please send me stitch instructions for a rectangular shape as our church prefers this shape and I have been looking for so long to find a beautiful stitch pattern and yours is the one I love. Bless you! WS rows: (k6, p6) k6. Thank you so very much for the free pattern. 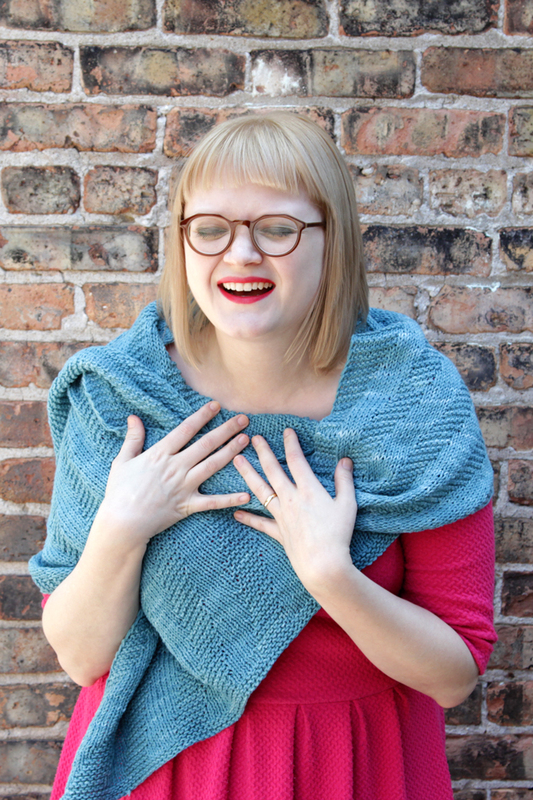 I was in the middle of admiring you modeling your shawl as I scrolled down to find the pattern free … Jumping with excitement.